In case you are not aware I am a Spiritualist and obviously I adhere to the 7 principals of my religion. I mention it here not because I wish to try and convert you to my beliefs, far from it, but it is the thread that runs through my website here. Many Christian sects associate mediums as working with evil spirits or the devil, this is so untrue and couldn't be further from the truth, so this is really to put the record straight. We work in the light and not with the dark side. Most historians agree that, as a propagandist for Spiritualism, she was unequaled in her zeal, commitment, and enthusiasm. 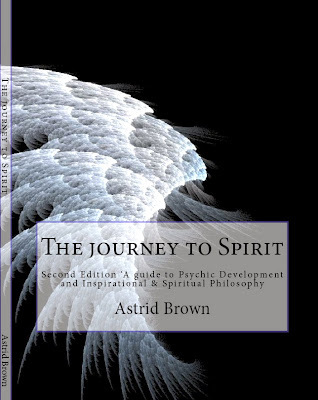 For years she traveled all over the United States, Canada, England, Australia, and New Zealand, expounding the truths of Spiritualism and related areas of thought. Although she was not alive to see this happen, her dream of establishing a proper and formal "school of prophets" (training school for mediums) was realized in 1900, with the founding of the Britten Memorial Institute and Library, in Manchester, England. Emma Hardinge Britten's writings include: Modern American Spiritualism, New York, 1870; Nineteenth Century Miracles, New York, 1884; Faith, Fact and Fraud of Religious History, Manchester, 1896; Extemporaneous Addresses, London, 1866. She was editor of the American periodical, The Western Star, 1872, and the British The Unseen Universe, 1992-1893. inspired in 1871 by the communicating spirit of Robert Owen (the founder, when alive in the physical body, of the Co-operative movement). Each of us has his or her idea of God. To some, He is an austere personality instilling fear in his believers and meting out wrathful judgement to wrong doers, seated on a throne in heaven. To others he is a benign Father, caring for his vast family of every colour and creed and personified in everything that is beautiful around us. The latter is the broad Spiritualist viewpoint as envisaging the one supreme power. We regard Him as the author of a divine plan, the natural law through which the universe which He created is governed and based on love, not fear. He is the controlling force of all and “the Greatest Central Source of all life and love” as Andrew Jackson Davis, another of our pioneers so forcefully proclaimed. When we transgress these laws we are betraying a trust for which we shall have to pay, either here, on in the life hereafter. Our relationship with God is therefore determined by our obedience to these laws. If we accept the Fatherhood of God then it naturally follows that we are his children, brothers and sisters in one family of all race and colour. This confers upon us a dual responsibility – to our Father and to each other, which we can sum up in one word – SERVICE. The inequalities of modern society, the rich and the poor, the weak and the strong, the wise and the ignorant, provide an incentive for love and service. In our daily lives we meet those who need material help, to whom a kind word or small act may work wonders. If we would extend this call to service beyond the confines of our family, our town, our country, out into the wide world, pain and suffering, tumult and wars would cease and we would bring into being “that peace which passes all understanding”. It goes further than that. The real meaning of our existence is not only our obligation to our fellow men. Man being himself a spirit here on earth, is immortal and the brotherhood of man is extended into the spirit spheres. Spiritualism therefore gives a new and higher meaning to our mutual interdependence and to Brotherhood. This is the key around which our whole philosophy turns. Orthodoxy denies the reality of communion with departed spirits, whereas for the past one hundred and twenty years we have proved conclusively that man not only survives physical death but is able, through mediums, to commune with those left behind. Not only that, they spend quite a lot of their time giving us help and guidance in various ways with our earthly problems. There are certain persons among us who are called mediums who are so highly sensitive to ‘spirit vibrations’ that they are able to establish contact with those who have passed over and wish to communicate with us. Each one of us has a spirit guide or helper – a ‘guardian angel’ if you like, who uses the medium as an instrument through whom he can talk. 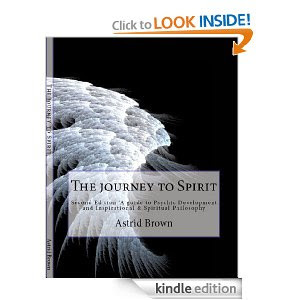 We are thus able to learn how our loved ones are faring in their new environment and in their new way of life. This proof of survival is of great help to those who are bereaved. There is a corollary of the previous principle and serves to accentuate how much our Spiritualist philosophy is so diametrically opposed to the materialist conception of life. All the great religions of the world subscribe to some form of life after death in some nebulous heavenly existence, but because they have failed to prove it to the satisfaction of modern realists, they have lost their hold on the people. Spiritualism on the other hand does prove this fact in no uncertain manner and in so doing has profoundly revolutionised our lives in that our behaviour is not encompassed within the narrow limits of our earthly lives, but extends into eternity. Our mode of living here will determine our spiritual status in the life to come. Spiritualism asserts that no one can save us from our wrong doing but ourselves. Man, through his conscience knows the difference between right and wrong and is given free will to choose which road he will take. No one, be he religious or an atheist can escape the consequences of his own mistakes. God does not sit in judgement over us, we have to be our own judges. What the church calls sin, we regard as the violation of the divine natural laws made by God, which Paul interpreted when he wrote “Whatsoever a man soweth that shall he also reap.” Man alone has to atone for his sins and not shirk his responsibilities. This follows on what has been said above. The orthodox church would have us believe that on this awful “day of judgement” God will sit on his throne and cast each one of us into heaven or hell. Heaven and hell are states of mind of our own creation and not celestial localities. Our code of life on this earth will determine our spiritual status in the world of spirit. It is equally wrong to think that because one attends church regularly, or performs evangelical or “other good works” one will automatically be given pride of place in the hereafter. It will be our everyday deeds and motive for them that will count and how well we have carried out the precept “Do unto others…” Neither is it true that after our passing we will become a saint. Death does not make us spiritually aware. The idea of eternal progress may seem hard for us to understand in this world where everything has an ending, but in the world to come, where there are neither clocks nor calendars, time is immaterial. Spiritualism points to the certainty of eternal progress, but the rate of our own particular advancement will depend upon ones desire to do so, remembering that we shall have free will as we have here. We shall by no means be idle in the spirit world, in fact, we shall be extremely busy pursuing those paths which will lead us toward perfection – and we shall have eternity in which to do it. The transition from our earthly world to our new existence in the higher life does not alter our present make-up or character. We shall be just the same as we were before the passing, retaining our free will to fashion our new life with the sure knowledge that we shall be given the opportunity to make spiritual progress with no limit to time or the heights we can reach. Once again, we come face to face with our personal responsibility even on the other side. These principles are the crux of our philosophy. They are inter-dependent and their influence has transformed man’s outlook on life. As a final note, Spiritualism, through an intelligent and thorough investigation of its Seven Principles, reveals the understanding, the deepest significance of service to others and transforms life from selfishness to unselfishness, from individualism to social co-operation. Only on such a foundation can love and truth and all other spiritual values have any practical meaning or reality. I myself have only once seen an angel and this was when I was recovering in hospital where I had been dangerously ill. At the time I was on the road to recovery and I woke in the night to see this vast being at the foot of my hospital bed. I wasn't in the least frightened but what I saw was incredible. It seemed to be neither male nor female and its skin, hair and wings were radiating gold and was dressed in red and gold robes. The wing span was massive and it stood from floor to ceiling. You can think of this what you will, but I did not imagine it and I knew then I was going to be ok and was being watched over. On another occasion when my daughter was six years old, she was very ill with influenza and I was rightly very worried about her. So I asked her guardian angel to watch over her carefully and keep her safe. Three days later when my small daughter was over the worst, she came to me and said, "Mummy someone is watching me in my room", and described what could only be an angel. She wasn't frightened when I explained who it was. Satisfied she went on to recover and didn't mention the angel again. Later on my daughter would go on to talk about other experiences but those are other stories! The Seraphim are closest to divinity. They are concerned with keeping divinity constant and intact, and are considered the angels of pure love, light and fire. They insure that only positive energy reaches to divinity, and create positive energy through all the choirs of angels and into the physical realms. When you wish to raise energy for humanitarian or planetary causes ask for their help and guidance. The Cherubim are guardians of light and stars. They create and channel positive energy from divinity, and appear exquisite in form. They outshine all the other angels. When you are seeking divine protection, wisdom, and knowledge, seek assistance from the Cherubim. The Thrones are assigned to planets. They create, channel, and collect incoming and outgoing positive energies. Their name comes from the idea that the power of divinity rests upon their shoulders. Justice and its dispensation are important to them and they will shine their light on injustices, and send healing energy to any victim. Thrones take great interest in what humans are doing, though they normally channel energies through your guardian angel. Look to the Thrones for assistance in smoothing relations with groups of people, nations, or individuals. Issues of leadership are under the control of Dominions. Dominion angels work to insure that humans are happy and healthy under the leadership they have bestowed. They are very concerned with cause and effect. If you wish to access divine wisdom, ask the mediators, the Dominions. Dominions will help you create or improve existing projects. Powers are the warrior angels who work through love instead of fear. Call them when you are in trouble or need to identify another's hidden agenda. They will bring clarity to your assessment of a puzzling situation. These angels will defend your home, property, children, or any group of people who call on them for protection and defense. The Virtues' primary job is to move massive quantities of spiritual energy to the earth plane and the collective human consciousness. The Virtues are the spirits of movement, working and guiding the elemental energies that affect our planet. These are the angels of nature (earth, air, fire, water, spirit, weather patterns, planetary upheavals). Call the Virtues to your assistance when you are in trouble or working in a healing profession. The Principalities are the guardians of large groups, including such as continents, countries, cities, governments, religious organizations, and humanitarian organizations. They work toward global reform and to aid leaders in wise choices. Human rights and economic reform are important issues to these Angels. The Archangels are the special forces of the angelic realms, who deal with all levels of humanity. They also create and funnel energies both ways. Angels are beings assigned to a particular person. They are often known as Guardian Angels. Angels deal with human and physical manifestation. Not only do they channel energy from the Divine to us, but also from us to the Divine. Guardian Angels are assigned to us through all incarnations on Earth. They are with us from birth to the transition of death. They defend us when we are in trouble, help us adjust to a human existence, and assist in carrying out our divine plan.